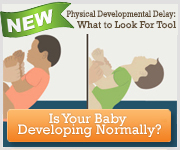 What are some of the developmental milestones my child should reach by seven months of age? Because each baby develops in his own particular manner, it’s impossible to tell exactly when or how your child will perfect a given skill. The developmental milestones listed in this book will give you a general idea of the changes you can expect, but don’t be alarmed if your own baby’s development takes a slightly different course. Alert your pediatrician, however, if your baby displays any of the following signs of possible developmental delay for this age range.